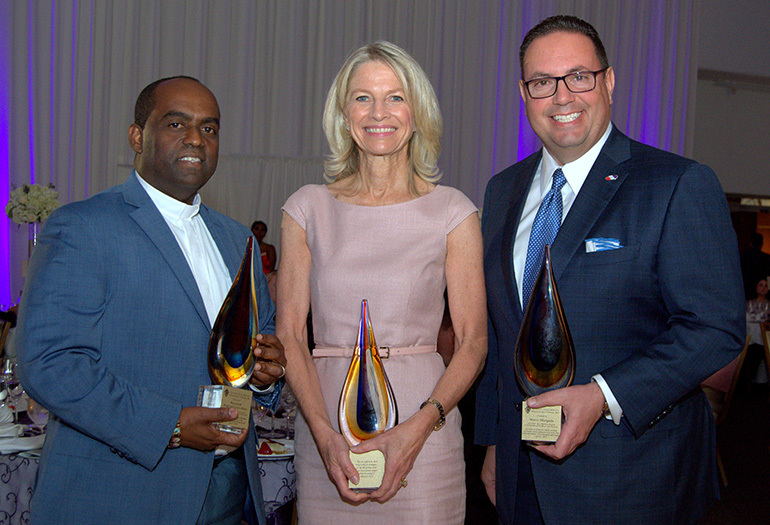 The three honorees show their New American Awards at the 20th anniversary gala for Catholic Legal Services in Miami on April 27. From left are Father Reginald Jean-Mary of Notre Dame d'Haiti Church; Julie Grimes, managing partner for a hotel chain; and Mario Murgado, CEO of a Miami-based auto dealership. MIAMI | Anastasia White is from Russia, not Central America or the Caribbean. But she knows something of the hurdles that modern immigrants face — hurdles that she says have gotten higher and harder since she arrived nine years ago. She had plenty of company at the 20th anniversary gala of Catholic Legal Services. More than 300 lawyers, clergy, community leaders and others gathered to celebrate the milestone, to honor heroes of the cause, and to donate to the group’s ongoing work. CLS got the hearty endorsement of Archbishop Thomas Wenski, who helped to found it two decades ago. 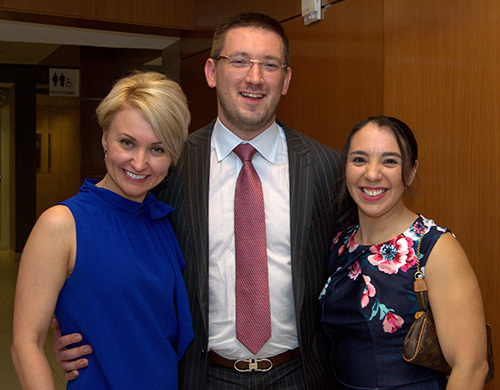 Younger lawyers who attended the 20th anniversary gala for Catholic Legal Services in Miami include, from left, Anastasia White, Aliaksandr Sirytsyn and Nadia Gonzalez. Hotelier Julie Grimes, who helped launch a foundation that trains and places inner-city residents for jobs in the hospitality industry. Grimes also chaired Miami’s Operation Hope for Haiti, partnering with the World Vision charity. Father Reginald Jean-Mary, pastor of Notre Dame d’Haiti, the main church for Haitian-Americans in Miami. Father Jean-Mary was honored for founding the Pierre Toussaint Leadership and Learning Center, where children and young adults learn music, literacy, culinary arts and civic engagement. Auto dealer Mario Murgado, himself an immigrant during a 1966 Freedom Flight from Cuba. Besides his business prominence, Murgado is a trustee of St. Thomas University and Florida International University, oversees Nicklaus Children’s Hospital, and is the former director of Miami Children’s Hospital. The Miami event brought some people from far up the coast. Among them was Father Frank O’Loughlin, who has fought for decades for the rights of migrant workers in South Florida’s sugar cane fields. Father O’Loughlin, currently executive director of the Guatemalan-Maya Center in Lake Worth, voiced something like awe for the determination of longtime activists like those at CLS, especially for children’s cases he sends to them. Although the gala wasn’t meant as a political rally, Grimes was one of several people who raised warnings about the direction of U.S. immigration policy. Also included at the awards gala was a three-minute preview of a documentary on unaccompanied children, being produced by Alexandra Codina of Miami. The preview shows a family of four struggling to stay in America and escape gang violence in their native Honduras. “We go well beyond politics and stand for the rights that we all have as human beings, and the rights that all children have, regardless of immigration status,” Codina said. Then she introduced the refugee family, who had been sitting at dinner with her, to effusive applause. 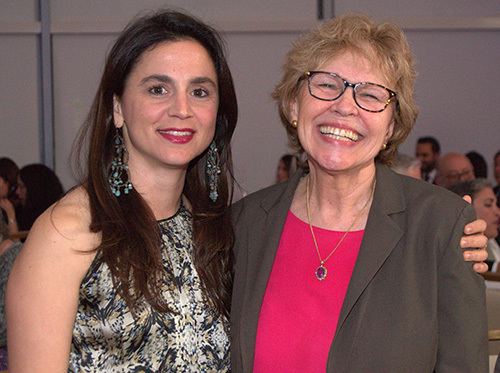 Filmmaker Alexandra Codina, left, shares a moment with Cheryl Little, executive director of Americans for Immigrant Justice, at the 20th anniversary gala for Catholic Legal Services in Miami on April 27. The film project, on which Codina has worked for three years, is due out in the winter, but it already won an award from the Tribeca Festival in the category of best documentary feature. Codina in turn was inspired by a 2017 report by Americans for Immigrant Justice on Central American children who were being denied asylum in the U.S.
His warning: Funds are drying up for groups like CLS, including Catholic Charities, Church World Service and the Human Rights Institute at St. Thomas University. Funds were raised for CLS in more than one way at the gala. The diners paid $250 a plate for braised short ribs, black truffle polenta and roasted veggies, with dessert of strawberry and guava cheesecake with vanilla custard mousse. They also wrote bids for a silent auction of jewelry. Finally, envelopes had been placed on each table for outright donations. Archbishop Wenski himself wasn’t shy about pitching for CLS in his own talk. He quoted a Creole saying: “To say ‘Thank you’ is to say ‘Please give some more.’” And apparently they did, clearing a total of more than $70,000 for the evening, according to chief operating officer Myriam Mezadieu. The evening drew not only professional activists but people like Henry Rodriguez, parts director for a local car dealership. This was his third time at the annual gala but perhaps the most evocative for him: Last year, he was in a car crash that put him in a coma for four months. His heart stopped twice, and he needed a total of 110 pints of blood. If the younger attorneys were any measure, the gala ensured the future of commitment as well as cash. Aliaksandr Sirytsyn, who was born in Belarus, likewise said the gala motivated him to continue the fight for immigrants. 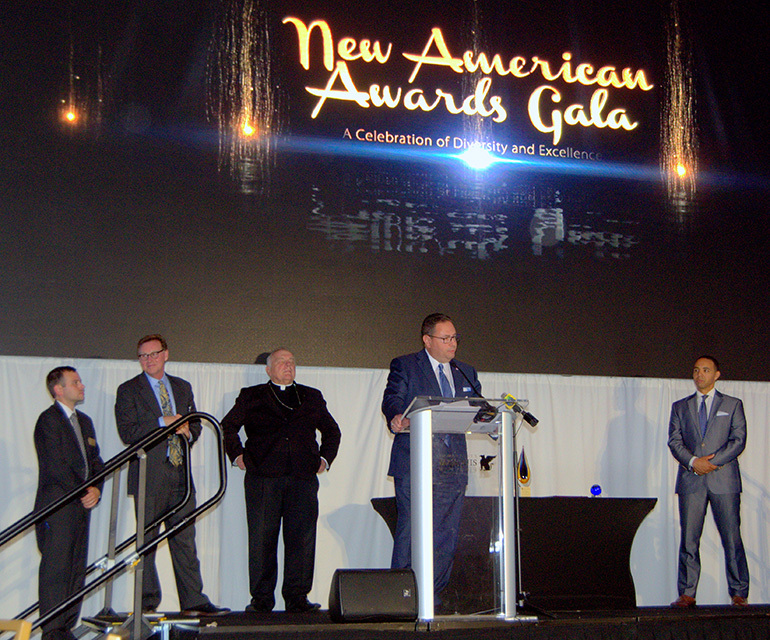 Mario Murgado gives his acceptance speech as one of three honorees at the 20th anniversary gala for Catholic Legal Services in Miami on April 27.